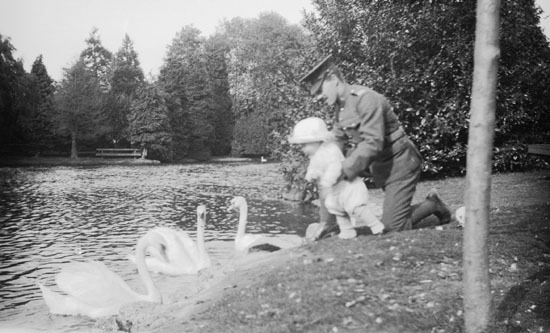 Charles Croft playing with an infant while in uniform. The A City Goes to War Document Archive has captured some of the documents available at the Saanich Archives. Visit the Saanich Archives website to search over 6000 images of Saanich online. To view soldier images: select the “Search Photos” box on the home page. On the next page, click on the “Search Photographs Now” button. Use the Subject drop down menu to select “Occupations-Military Personnel” and click on “Search Archives for Matches”. You can also see finding aids for the entirety of the Saanich archives collection.